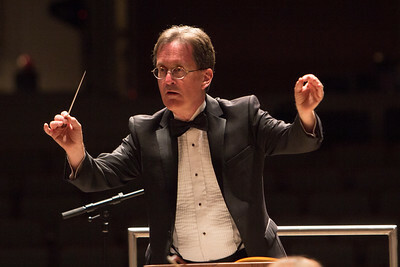 John Varineau has conducted the Grand Rapids Youth Symphony since 1986, three years after he began his tenure as associate conductor of the Grand Rapids Symphony. He has conducted the Classical Orchestra since its inception in 2000. Committed to nurturing the next generation of classical musicians and music lovers, Varineau has an infectious enthusiasm that he shares with students across West Michigan. Varineau conducts concerts on nearly all of the Grand Rapids Symphony’s regular series, as well as in the orchestra’s performances with the Grand Rapids Ballet. He has made three recordings with the Grand Rapids Symphony and three with the Royal Scottish National Orchestra. A clarinetist, he plays in the contemporary music group Ensemble Montage and the woodwind trio ma non troppo. Varineau is also an adjunct professor of music at Calvin College, where he conducts the Calvin College Orchestra and teaches clarinet. He also conducts the Calvin Community Symphony, an ensemble open to Calvin alumni and community musicians. A native of Laramie, Wyoming, Varineau attended Michigan State University and the University of Wyoming and earned his master’s degree at Yale School of Music. He and his wife, Gwen, have two children. Kristen Shoup joined the Grand Rapids Youth Symphony organization in 2001, sharing Classical Orchestra conducting duties with Conductor John Varineau. 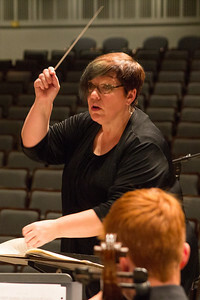 She also conducts for the West Michigan Homeschool Fine Arts Association and has previously been an orchestra director for Grand Rapids Christian Schools and Calvin Christian Schools. Shoup earned a B.A. in music education from Western Michigan University and a Master of Music degree from the Eastman School of Music. She has been a member of the viola section of the Grand Rapids Symphony since 1992. Barb Hammond has been the manager of the Grand Rapids Youth Symphony organization since 1990. A Grand Rapids Youth Symphony alumna as a violinist, she worked for 28 years as an orchestra director with Grand Rapids Christian Schools. She has a B.A. and M.A. degrees in music education from Calvin College.